Are you an internet-savvy blogger or web developer who likes to make webpages and templates? Diving into this work, you will find yourself immersed into a whole new world of coding, which geeks will definitely love. Well, for those Blogger 'geeks' out there, here's some good news! Google Blogger has just updated the Blogger Template HTML editor, and added four new features to make your experience even better! Now, whether you're a casual blogger, or a geek who likes tweaking his blog's template every now and then, this is place you now want to be! Check out these latest features now! To get to this HTML editor, go to your Blogger dashboard, and open the blog you want to customize the template. From the Blog dashboard, click on the Template option from the left sidebar, and then find the Edit HTML button. What's new with the Template editor? The new features are centered more towards user-friendliness (or rather, programmer-friendliness) and aim at boosting productivity. Previously, the Template HTML editor was much like the shapeless, bland HTML editor you get with Blogger posts (not that I'm complaining, it's a good way to keep things fast and simple). .....which, by the way, has finally arrived! Blogger has made the template HTML editor much more comfortable to use by adding the following features. Line numbering - Now, you can see line numbers on each line, making it much much more easier to spot errors and keep track of your code. Syntax highlighting - Much like in advanced code editors, you can now see syntax highlighting. The editor will actually color code different objects in your source to make it much more readable. Auto-indentation - I love code editors that auto-indent code for me so that I won't have to press all those extra Tabs and Spacebars. But more than that, this feature helps you keep your code organized, and you can easily keep track of what belongs where. For example, you can easily figure out what's inside your div tag, or what have you included in a list etc. You can see auto-indentation coming into action while you're writing some code. 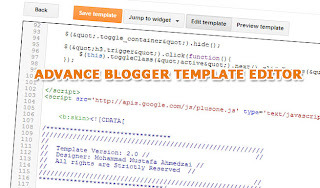 Blogger template editor will automatically put in the spaces for you. You can also use the Format Template option to clean up the indentation of your entire template. Code folding - I love this option too. Once I'm done with a particular piece of code, such as a div tag, I can simply fold the code, and not have to look at that large chunk of code again. You can see this from the image below. If you follow to where the arrow is pointing, you will see a small, grey arrow (►) next to line number 13. And if you look at the line number below, you will see 582, which means that the editor just saved me from having to scroll down through 569 lines of code! Jump to widget - Now, you have a quicker way of jumping to particular section of code in your template - code that belongs to a widget. Just click on the Jump To Widget button at the top of the editor, and you can see a list of all widgets you can jump to. Clicking on any will take you to the respective section in code. Yup. This new Blogger Template HTML editor does have a lot of new improvements and really friendly. Thanks for the news. hi, can you tell me how to download full template. I can't see this option anymore! Thats a great feature and you can search the codes by ctrl+f and press enter. @Qasim ZaibPress Ctrl + F and enter your keyword and then hit enter. You can easily find your keyword. No Need to format template. I KNOW THIS BLOGGER SERVICE BEFORE A DAY. BUT THIS ARTICLE CLEAR EVERYTHING. I don't like this new feature as it sometimes block my dashboard and I don't know why. After that, I must to refresh the browser or open Blogger in new tab. Hi Mohammad ,Salavabalekum ,pls let me know how can i add Chitika adds in between the posts in a blogger . Ofcourse i liked them very much... For template designers its a good update. how to expand template widget ?? Nice post bro...where is that expand widget option? now browser find will not work in new update! code folding feature is taken from browser element inspector like in chrome. Nice work blogger! What about the Expand Widget how we will find and add codes? Much Needeed Update by Blogger. In order to expand the codings for widgets and post body simply press the Format Template button. After that click anywhere inside the editor and press Ctrl+ F to find any piece of code inside the template. So to edit your template correctly follow step#1 correctly. This is a very nice article on blogger html editor i like your article. Yah, this new version of blogger template really surprise me, I thought there was something wrong with my web browser. But when i try to click those black arrow beside the the number, scroll down, and have some explorations, I've found that this is very usefull because Blogger.com wants only to make us bloggers to perform easier and faster. Loved the new improvements until I discovered my Ctrl F no longer works. Cursor sits stubbornly in the search box and refuses to budge. I Am Unable To paste my copied Html Materialinside XMl section of Html Due Not Proper Working Of Paste By Right Clicking !! Plss Help me How to Do it. pls bro tell me how to Edit n expand HTML n how to pulish changes. how we can see PRIVIEW in new tab or new window. After April 2013 updation, I am not able to edit the blogger templates at certain point. e.g., I could not find blogger background image links, also width of the blogger, etc.. How to do those? Actually,for templates those downloaded from internet, these edit works are very much necessary.. Can you help me out? I can not found /head in new editor. Please tell me how can i find it. this is really great... but i have just moved my blog to WP from blogger, was lacking from lots of html and css functions... as i am not pure developer... but now in wordpress i can put lots of tricks on various subjects with nice UI... nways thanks for your tips..
i think old editor is good. thanx for sharing article,its really helped me. is is really great... but i have just moved my blog to WP from blogger, was lacking from lots of html and css functions... as i am not pure developer... but now in wordpress i can www.perfecthackz.blogspot.com put lots of tricks on various subjects with nice UI... nways thanks for your tips..